Annuity rates are under threat after the 15-year gilt yields collapse 29 basis points during the month following the Federal Reserve delay to tapering the stimulus package and the US debt ceiling crisis. Gilt yields have suffered from the financial and political policies in the US and this is having a direct impact on annuity rates for people returning in the UK. 15-year gilt yields increased 23 basis points to 3.38% during the month. As a general rule a 23 basis point rise would see annuity rates increase by 2.3% and standard annuity providers followed quickly with increases of 2.28% matching yields. Yields have ended the month down by 7 basis points on last month. The rise in yields has been in part due to the market expectation that the US Federal Reserve was about to taper the $85 billion a month stimulus package and when this was delayed investors started to reverse earlier actions, sending yields lower. This was coupled with the impending deadline of the US Government reaching their $16.7 trillion debt ceiling and running out of money on 17 October sending investors to safe havens such as US Treasury notes and UK government bonds and gilts. The fall of yields to 3.09% means standard annuity providers will have to reduce their annuity rates at least in the short term. 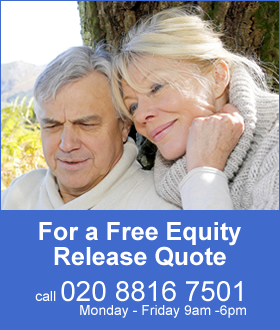 The enhanced and smoker annuity providers have already decreased rates by 0.36%. In the short term, one month, we would expect standard rates to decrease by 2.98% on average with lifestyle enhanced and smoker annuities decreasing by 0.34% on average. Only 59% of annuities increased for mainly from standard annuity providers with improvements of between 0.1% to 3.8%. The biggest gains were for those aged 65 and over with smaller gains for those aged 55 to 65 and no rates were lower for standard rates. Enhanced and smoker rates were mainly lower with all the decreases from this category and in particular for those aged 55 to 60. One exception was 100% joint life aged 70 or under where annuity rates increased. Equity markets started at 6,413 and increased 49 points to end at 6,462. This represents a 0.7% increase and for people that remain invested have seen their fund rise in value slightly which would complement the rise in pension annuity rates. 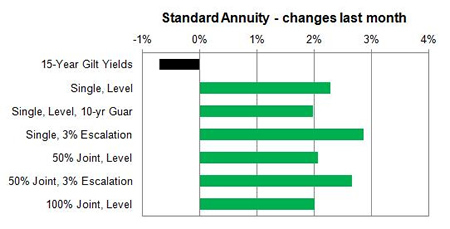 All standard annuities increased following the rise in yields and by the end of the month where considerably higher compared to gilts indicating a correction will happen shortly. Lifestyle smoker and enhanced annuities have decreased in line with the fall in gilt yields as is customary with providers of impaired annuities. 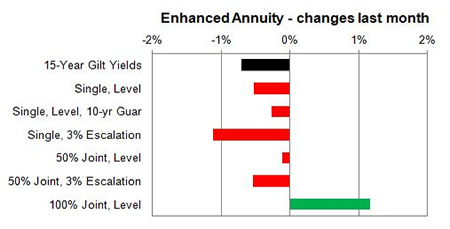 In the short term it is likely that annuity rates will decrease slightly especially if yields drift back down as can be seen in the following chart. For smoker and enhanced annuity rates on the 100% joint life, level basis annuities remain higher at the end of the month although last month these rates lagged behind the increase in yields. Gilt yields continued to rise following the announcement from the US Federal Reserve that they were going to taper the $85 billion a month stimulus package. The Governor of the Bank of England Mark Carney "forward guidance" policy to keep interest rates at 0.5% was challenged by markets by selling gilts thereby decreasing prices and increasing yields. As a result yields increased to the highest point in two years at 3.38% before a turnaround by the Federal Reserve not to embark on tapering just yet send yields lower. The US debt ceiling further worried markets with the brinkmanship between the Government and Republican run House of Representatives. The 15-year gilt yields have reduced to 3.09% as investors seek safer havens in times of uncertainty.